“Opening the Ball” like “Seeing the Elephant”, was one of the many ironic and morbidly amusing terms used in the Civil War. The former was another way of saying the start of a battle. The latter was synonymous with the earth-shaking experience of one’s first encounter with combat. 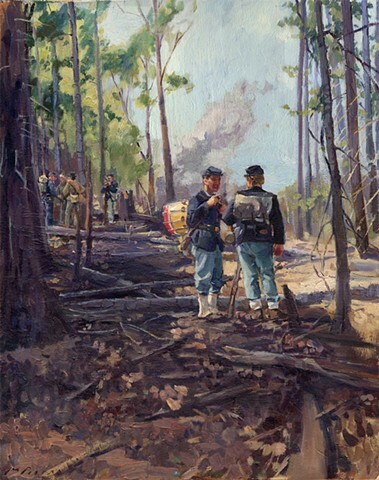 These two Union soldiers are exchanging thoughts in the aftermath of such an inaugural episode. It is the spring of 1862 and we are somewhere on the Virginia Peninsula. A patch of forest has been burned down and still smolders in the distance. Meanwhile two Confederate prisoners, one nursing a head wound, chat with their captors.